This Fellowes Shredder Stand is an ideal solution if you want to make your home or office shredder more portable. 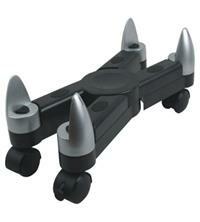 It features a fully adjustable width and has a heavy duty construction which can hold up to 50kg. It also has lockable wheels to keep it in place and there is minimal assembly required. The black and silver design should fit into most environments and make the job of moving your shredder around much easier. Warranty on the shredder stand from Fellowes is 1 year.